I have been really back and forth lately with the colors I choose to put on my nails. There is one thing I have noticed, my toes are all bright, bright, bright, while my fingers are a little bit more… subdued. Well, I don’t know if subdued is the right word for it, but they’re not hot pink. I wanted to share with you guys a couple of my favorite shades right now. Take a peek. Now, the purple and the green are basically flat out primary colors. I have the green on my nails right now and while I’m kind of digging it, I don’t know how long it’ll last being that it is THIS green. See…. Like… green green. The whole point of buying the purple and the green hues were because I am kind of attracted to all things Fall right now. I think it may have something to do with the baby and my hormones, because I really have no other way to explain it, hah. I want to wear sweaters and boots right now and paint my nails Linkin Park at Midnight… I’m all about Fall right now even though summer has just kicked off. So these two shades have been my happy medium. I don’t have a picture of what the purple looked like on, but I can say that I did love it! 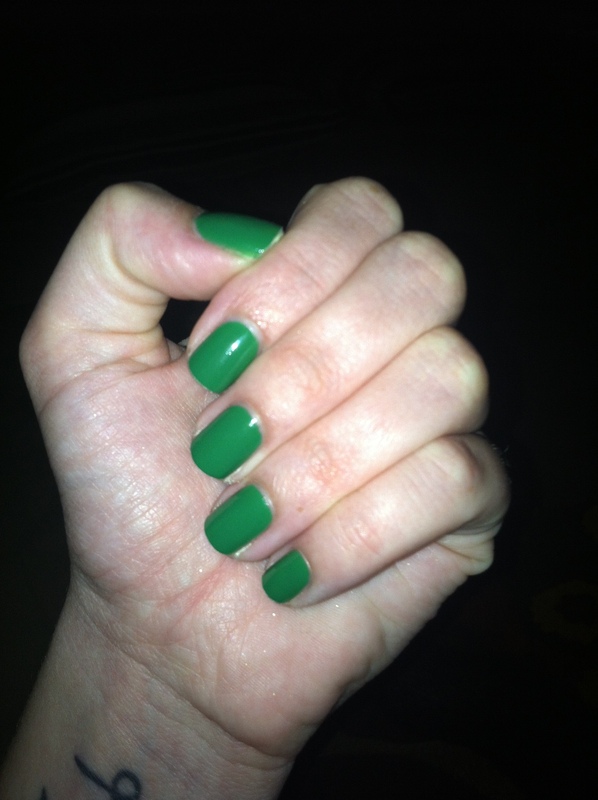 The greatest thing about these two colors from Revlon is that they last a super long time without chipping. I had the purple on for over a week and it just looked worn as it was growing out with my nails but not one nail started to chip. So I highly suggest this brand. The green is 571 – Posh and the purple is 240 – Impulsive. I just love the names too! hah These two colors were actually on sale at the drug store for about $5. My next love, which I am surprised I didn’t talk about first, is my coveted blue shade from NARS. Sorry kids, had to take the picture off of my instagram.. I thought I had another one saved but it doesn’t appear to be so. (Speaking of… follow me on Instagram! TheRachelRoss of course) SO! I originally saw this color on Pinterest, of all places, and I was like I HAVE TO HAVE IT! And it took exactly one week for me to go out and find it. The color is called Kutki and it is part of a very fabulous limited edition collection of colors. Doesn’t the phrase “limited edition” give you anxiety? It’s like why can’t you just put a time limit on it? It really gets the job done of freaking me out and making me believe I have to buy something right then and there or else it could be gone forever. Actually… I did end up snagging the last of these from Lord & Taylor so I guess the whole Limited Edition and limited time offer thing is pretty legit. ANYWAY! For me, this is the perfect shade of blue for the summer! Essie’s Turquoise and Caicos is all the rage every summer, but if you want something a little more true blue, this is the shade. It was $18 at Lord & Taylor department stores, and totally worth every penny. It kept its bright shine and didn’t chip for the week and a half I kept it on. Perfection. The last color is I Need a Refresh-Mint by Wet-n-Wild. I really liked this color because it’s kind of a combination of the blue and the green I’m so into right now. Sadly, I don’t have a picture of this one either, but take my word for it, it’s a lovely color! So that’s it kids! A couple of my favorite nail polishes right now. I spotted Essie’s new resort collection in the store yesterday but somehow contained myself from buying every single one of them, don’t ask me how! That is so unlike me! haha. I am crushing on Mojito Madness and Off the Shoulder, so I may have to make some new purchases and do another little review for ya soon. Well, it’s beautiful out and my pool is waiting for me. So until tomorrow, have a lovely day! Kisses.